1. 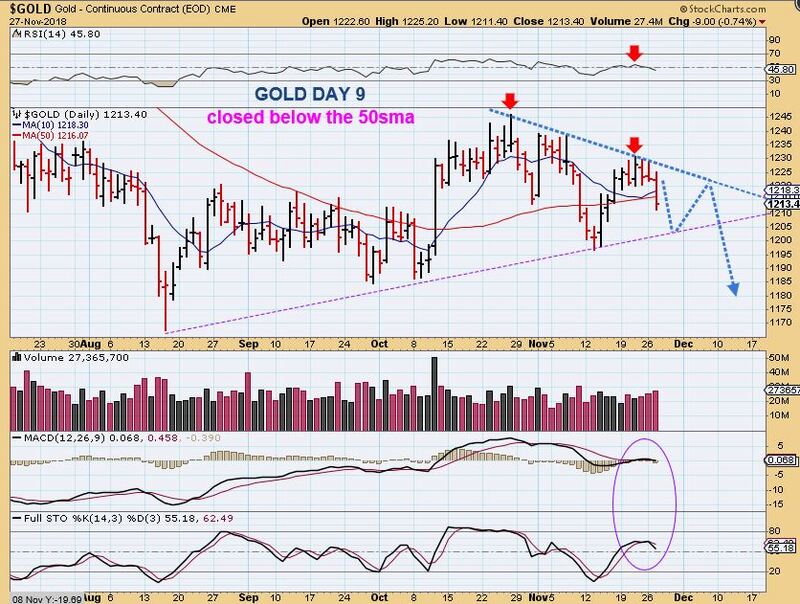 GOLD MONDAY – Above the 50sma, it looked hopeful and Bullish on Monday, even though this was the start of the 3rd daily cycle. 2. 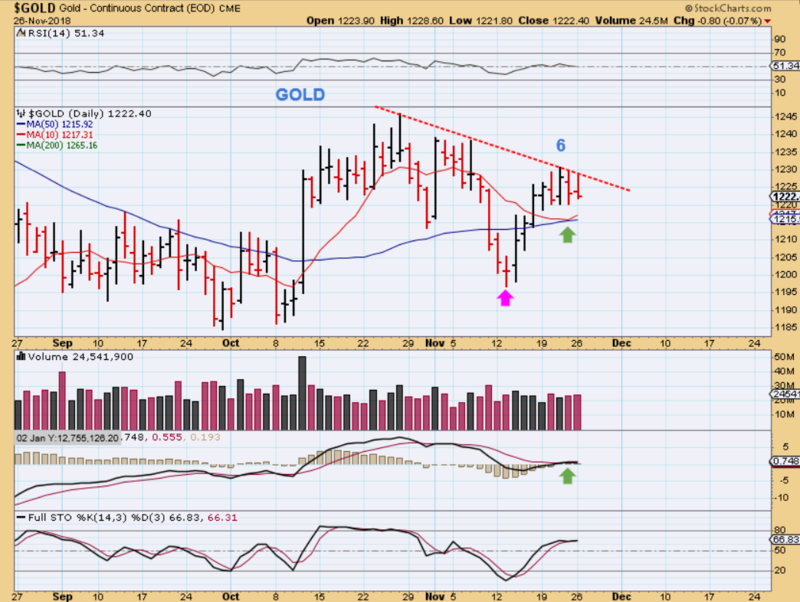 GOLD TUESDAY – This was Gold closing under the 50sma during Golds 3rd daily cycle. This now looked QUITE Bearish breaking down Tuesday, since volume increased on the sell off and the RSI & MACD crossed down. 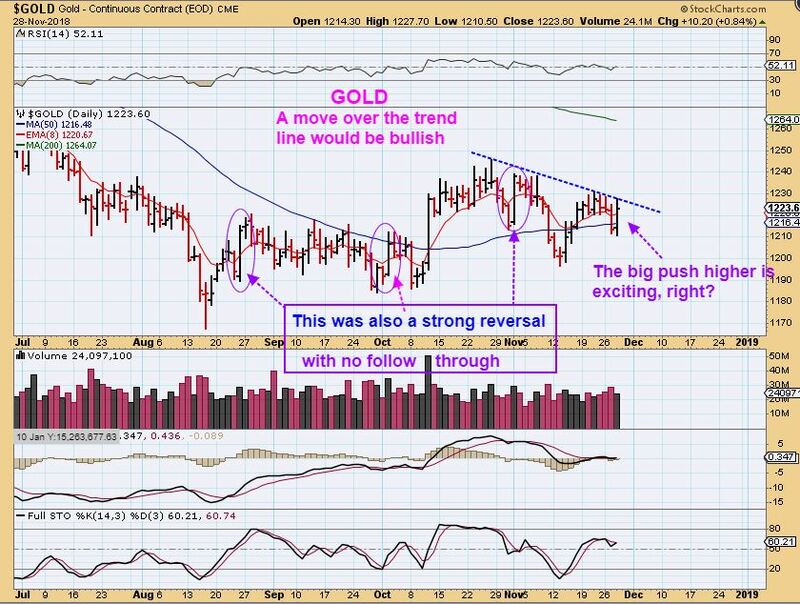 GOLD – Many strong reversals or surges higher still just turned into sideways moves, as shown here. This still may not amount to very much in the bigger picture. A break above this down trend line would definitely add to the bullishness and would threaten a run to the green 200 sma line. Read the chart. 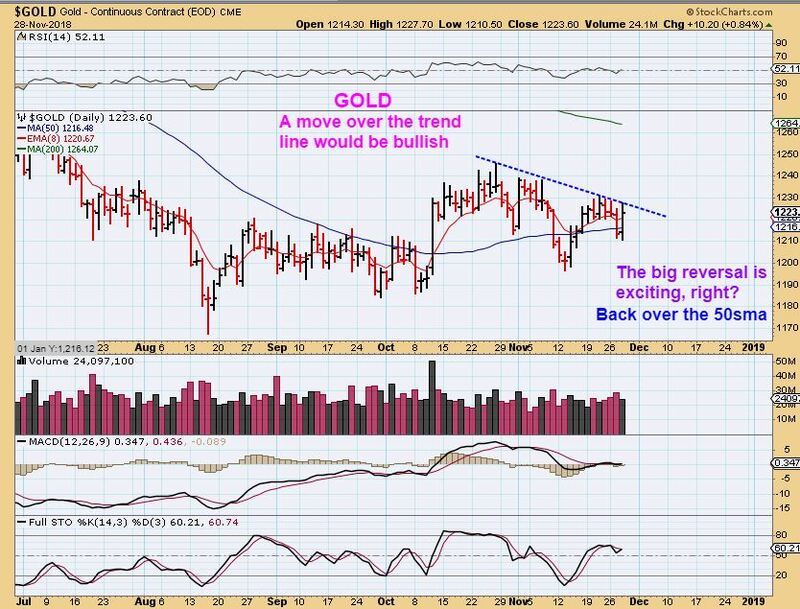 GOLD – Gold has had a very big move higher recently on November 1st, but it rolled over too, right? My emails are asking me, “Did this change everything?” We cannot know from one strong day, since we have had that in the past and nothing more became of it. We still need to use stops and be cautious if you went or remained long. These markets are choppy & devious. SILVER – Silver actually looks like a bullish base with a shake out, recovery, trend line break and back test. I honestly think that Silver looks bullish here, but this has gone absolutely no where for 3 months, it can continue to do that. ‘Base’. 1. 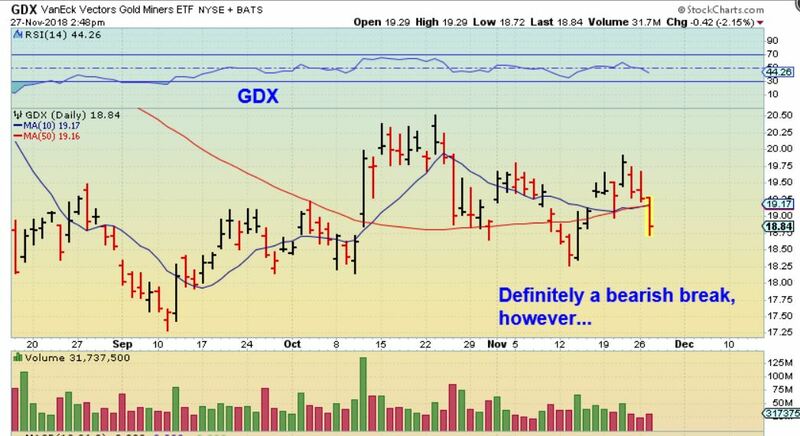 GDX YESTERDAY – This definitely looked Bearish as it broke and closed below the 50sma. 2. 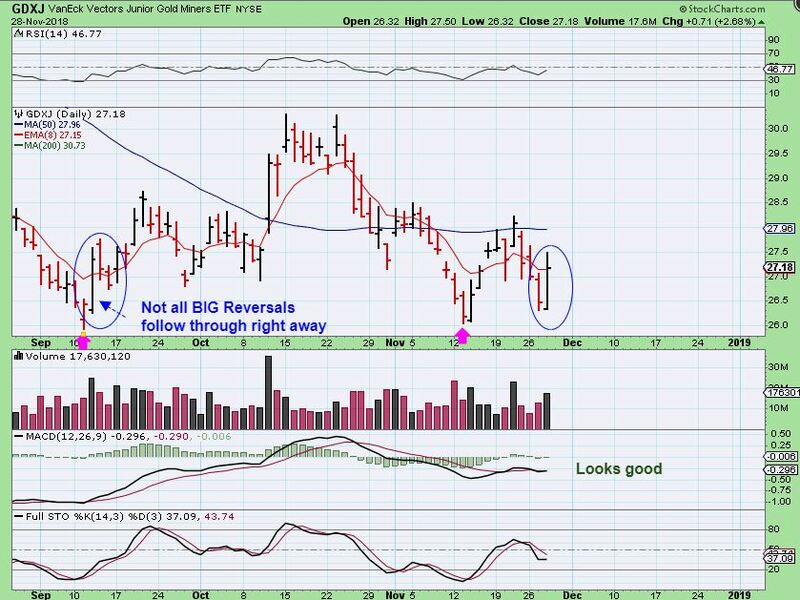 GDX – Now GDX looks to have reversed at the lows? 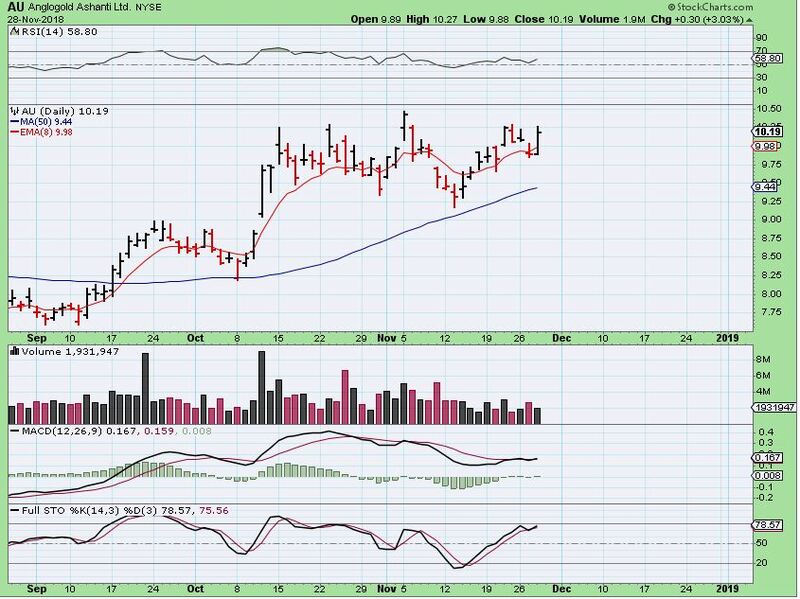 Yes, this now looks bullish again, and so it can be bought with a tight stop, but 1. G-20 is ahead and 2. this has really been a choppy frustrating set up. 3. Day 6 can still remain the peak & this could break down next week, we just can’t tell at this point. For example: My stop was below the blue arrow DCL when I bought, but I moved it up under the 50 sma, and I got stopped out at the 50sma as a result. I would have to re-buy & risk getting stopped out for another short gain or loss. Choppy sideways action is difficult. Note: Choppy sideways action seen above is difficult, but after building a base like this, a break out & run higher would probably begin to trend in that direction and buying pull backs would be easier & rewarding. Nobody wants to ‘miss the move’ out of the lows, but this sideways chop has been causing paper-cuts for weeks now. You must decide what is the best trade set up for you to pursue, meanwhile some individual Miners do continue to act bullishly. Lets discuss this sector a little bit further. 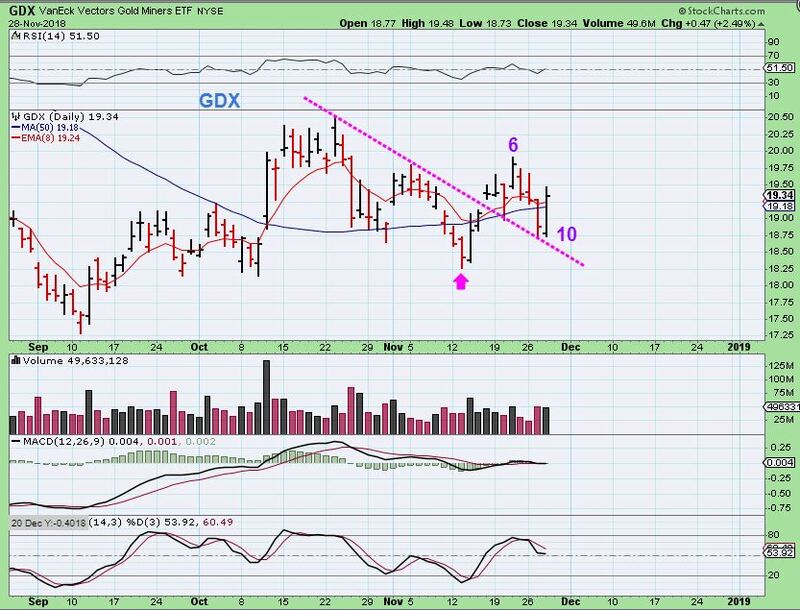 GDXJ – We are looking for follow through. We have seen large up days, but there is no guarantee that we will see higher price continue. Looking at the large day higher on September 14, the next 2 days were red. 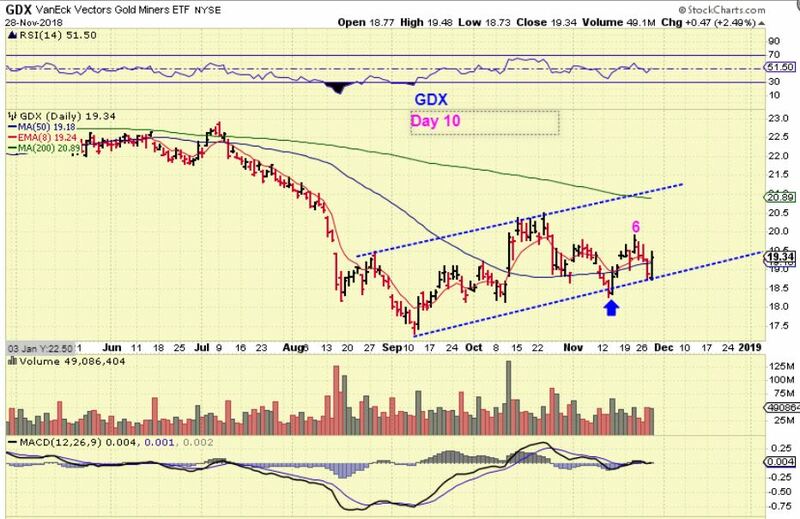 GDX – The current set up is that GDX has a day 6 ‘peak’ and today is day 11. If that peak does not get taken out, this will be a left translated daily cycle. 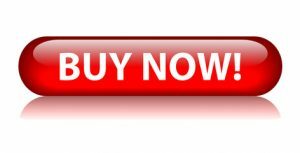 If price beats day 6 Thursday or Friday, it’ll be a peak on day 11 or 12 so far ( Still can be L.T.) And then we face G20. Do you feel lucky, kid? Do ya? It is a very tough call here, because we have seen large up days and large down days often. 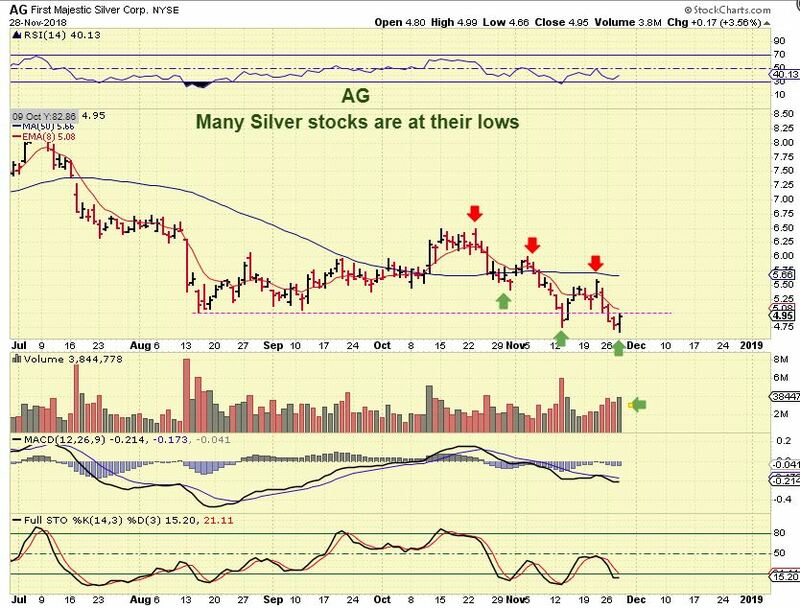 AG – This is actually a series of lower highs and lower lows, so several Silver Miners like AG are at their lows. IF A big run was going to start now with the FED SPEECH followed by the G20 Mtg, this would be a shake out, but you’d still be getting bargain prices. 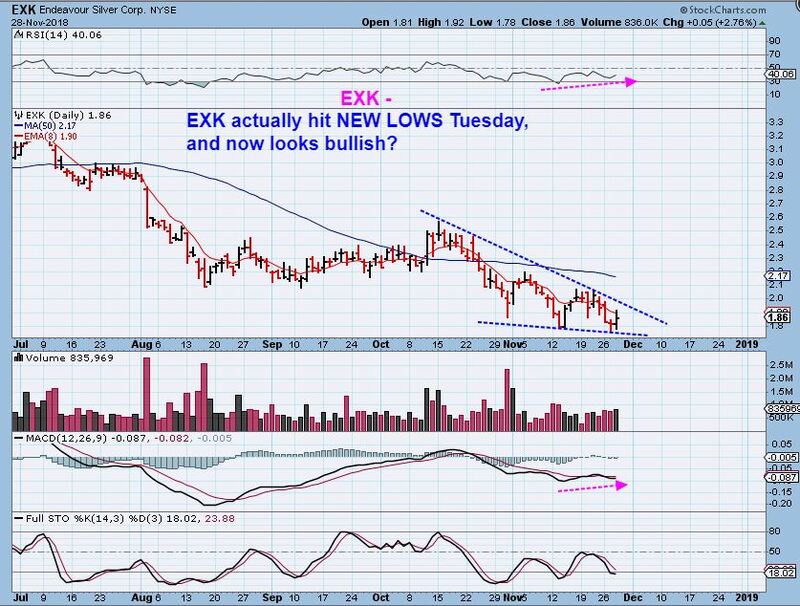 EXK – EXK hit new lows, but suddenly looks like a bullish wedge. So we are getting more Mixed signals. 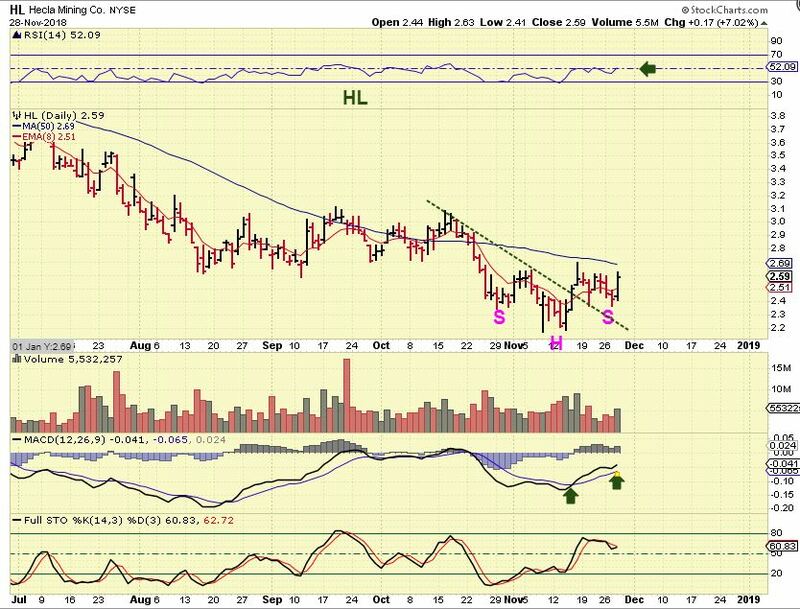 HL – Inverse H&S with HL. Hecla is also still at THE LOWS, but the RSI is at 50%. 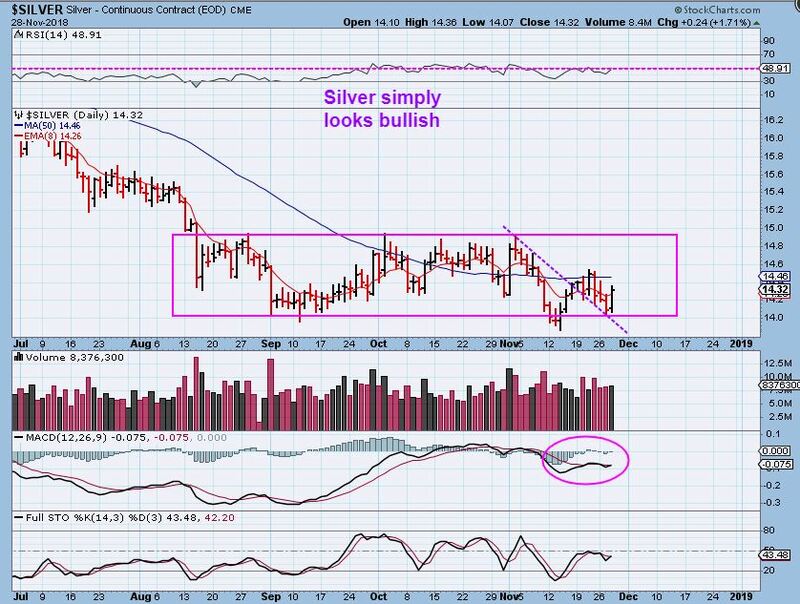 Silver stocks look like they want to move higher. Next weeks post G-20 results may be the answer. All I can say is that this is possibly the most mixed I have ever seen the Miners. We have seen Many Silver stocks breaking to new lows right now, and yet several other Miners have been running higher and remaining bullishly at highs, like ABX, AU, etc. We have GOLD & GDX breaking down below the 50 sma one day, and then sharp reversals that are news driven and often short lived. 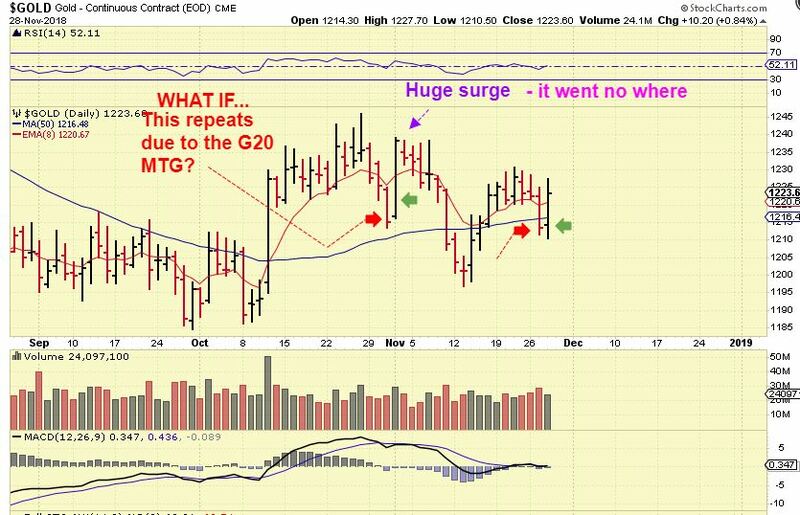 The USD is due for a drop, which is usually good for Gold, but GOLD is in a 3rd daily cycle, that is often when it weakens. Throw in a FED discussion that sounded a bit more dovish and a G-20 meeting that may see Trump enforce greater tariffs on China or come to a trade agreement that is favorable, and you have more volatility, whip saw possibilities, and uncertainty. I think Fridays action will be important when deciding how much of anything you want to hold going into this weekend. November 29th – Enjoying The Ride? https://chartfreak.com/wp-content/uploads/sites/18/2018/11/RIDE.jpg 702 888 Alex - Chart Freak https://chartfreak.com/wp-content/uploads/sites/6/2013/04/black_logo.png Alex - Chart Freak2018-11-29 12:24:072018-11-29 12:24:07November 29th - Enjoying The Ride? SPX - After breaking above the 10 sma, SPX was turned down at the 50 sma and revisited the lows. 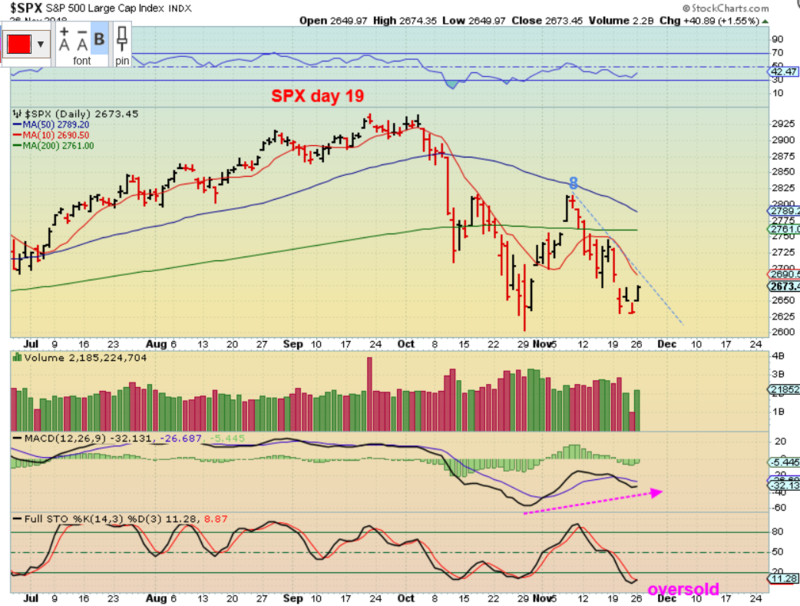 The SPX is oversold and the MACD does have divergence so we are at least getting a bounce on day 19. From my weekend report, the ICL could be ahead, and if so, any long trade will be capped. 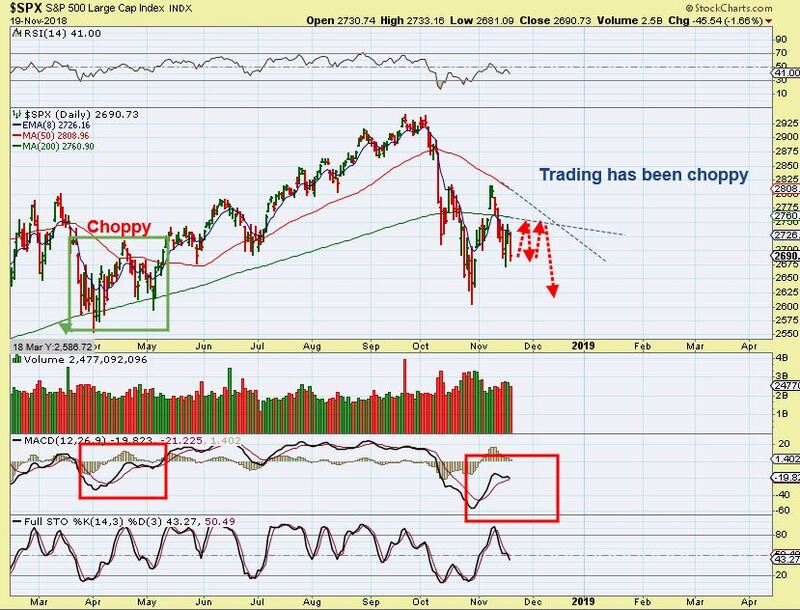 I discussed my thoughts on the General Markets in greater detail last week and in the weekend report, but let's take another look at the NASDAQ. 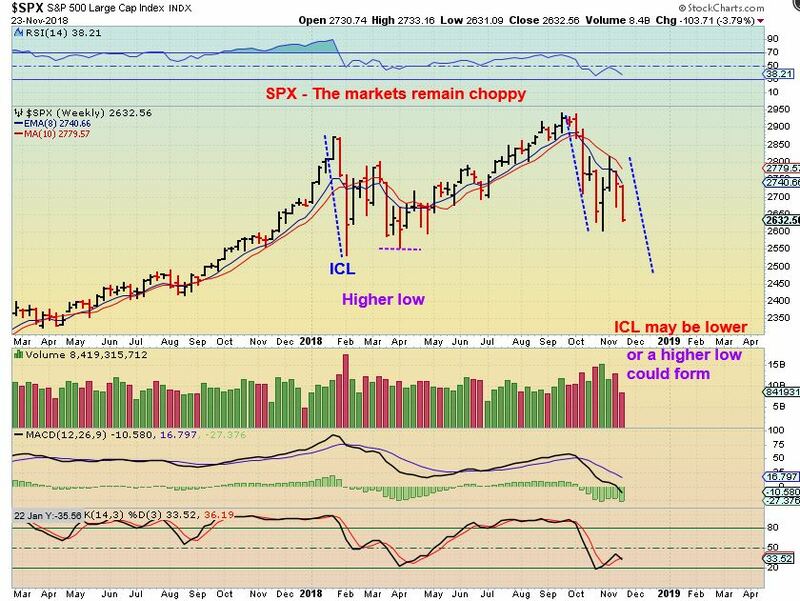 SPX- The markets dropped toward their ICL, and I mentioned that similar to what we saw in Feb & March, this could now become a choppy market, instead of the 'Buy he dips' that everyone got used to. The ICL could still be ahead, and I will explain why, but if that was the ICL in October, this could just remain choppy putting in a higher low like last April. See the chart. 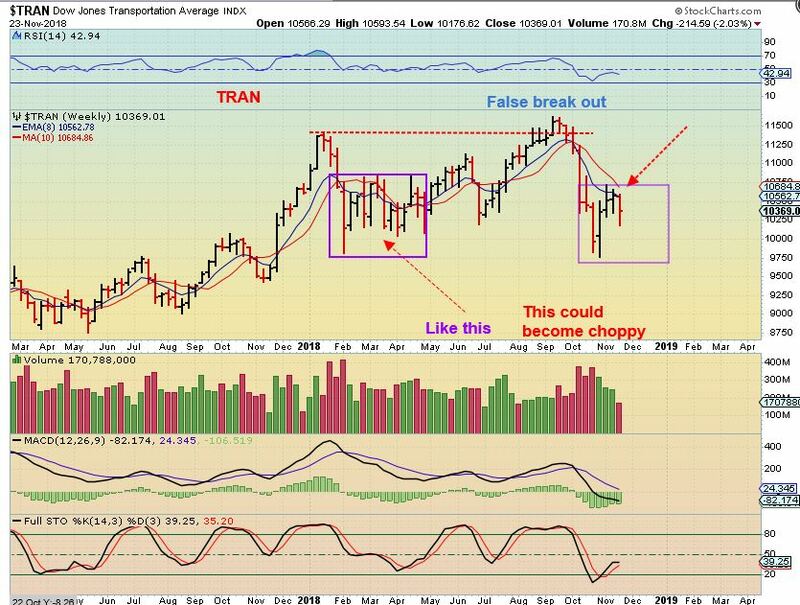 TRAN - The TRAN actually broke to a new low, below the Feb lows. As mentioned in prior reports, this could become a double top down the road. Expect Light Holiday Tradin’ ? One would expect a light volume holiday trading week, but so far many of the charts that I looked at have normal or average volume. Maybe it will lighten up each day, but let's take a look at what trading took place after the weekend report. SPX - The markets have been choppy and instead of that inverse H&S pattern breaking back above the 200 sma again, Monday the Markets dropped. 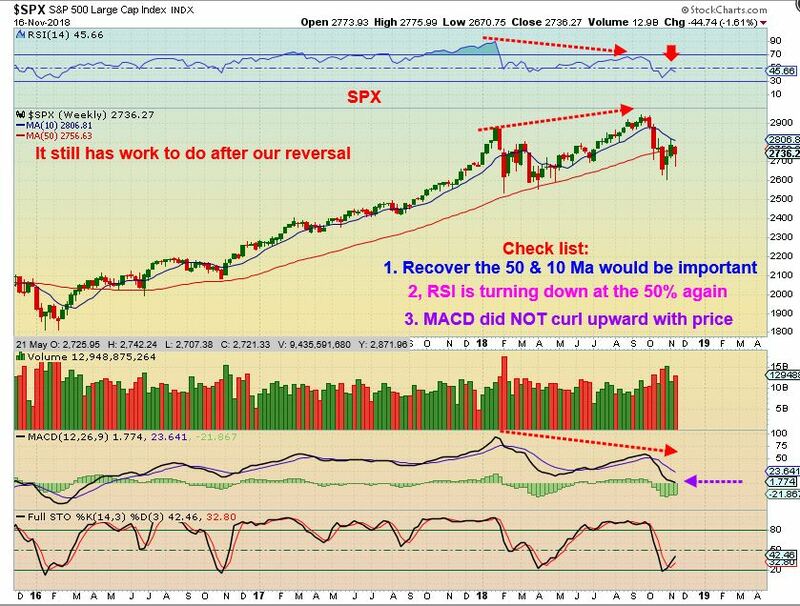 I used this chart in the weekend report along with the increasingly ugly charts of FB, GOOG, NVDA, and even the IWMs lack of strength, to show the current weakness. I warned again that if we don't see strength soon, we may see an a-b-c drop that looks like this on the General Markets Weekly Charts. https://chartfreak.com/wp-content/uploads/sites/18/2018/11/TRADE-IN.jpg 640 751 Alex - Chart Freak https://chartfreak.com/wp-content/uploads/sites/6/2013/04/black_logo.png Alex - Chart Freak2018-11-20 04:15:502018-11-20 04:15:50Expect Light Holiday Tradin' ? 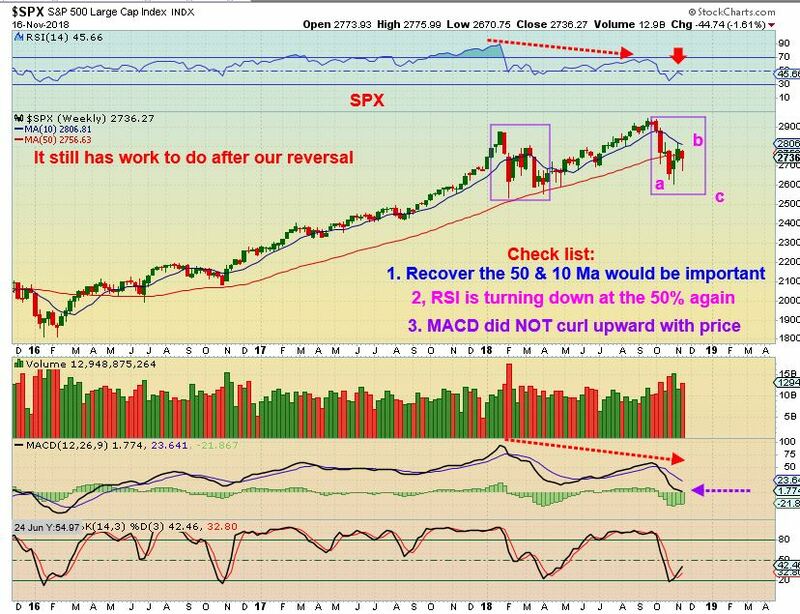 SPX WEEKLY #1 - We see that price has moved to resistance, please read the chart.